Getting a good start is very important for winning races. A good start lets you pop out of the crowd into free air, and be free to choose the direction to go. The most important item for a good start is knowing exactly where the line is. At the minimum, this lets you know how many boat lengths you are below the line. If you have good onboard software (like OS5), it can predict when you will cross the line, which allows you to cross the line with a good head of steam. See the Dogleg Start and the Oculus Start. The traditional method of establishing the line is to sail by each end of the line and ping them as you pass by. For club-level racing, this is the most straightforward way. However, for large events, the rules don’t let you in there to ping the ends. This has led to more indirect methods. A more indirect way is to take multiple bearings of the ends, or by using a laser rangefinder. Your software must be able to handle this method (OS5 can of course), and a laser rangefinder is not exactly an affordable gadget. Recently, Mike Ruhland suggested an interesting way to produce a very accurate line without getting very near the line. We call this the Extension Method. 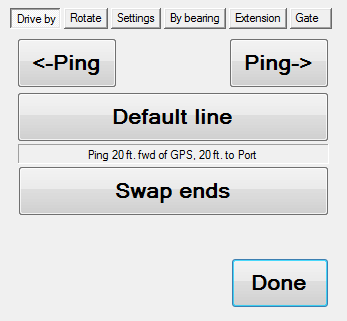 Sail along the starting line extension and drop two successive pings (‘Ext1’ and ‘Ext2’) when the two ends of the real starting line align exactly. Since the bearing of the line extension depends on the angle between the two extension pings, the further apart they are, the more accurate the extension line will be. 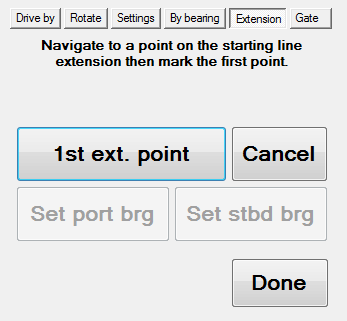 After the line extension has been established, drive down below the line and point the boat at the line ends, and tell the software to calculate where the intersection is. When you are satisfied with the result, tell the software to update the starting line location.